First I start by pricking the sausage on both sides to give them a way for them to release steam from underneath the skin before I grill them on my indoor grill pan. I fill a small saute pan with 1/2 a cup of chicken stock and put the sausage links in the pan with a lid and steam the sausages for about 15 minutes, just to make sure they will be cooked all the way through and give them some extra flavor. After they have steamed I go ahead a grill them on the grill pan just for the grill marks I think it gives a nice presentation to the final dish, ( This step is optional). I Julienne a red, yellow, and orange bell pepper. I slice a sweet onion very thin into half moon slices. I then slice 3 garlic cloves very thin. I cut up a small bag of the baby gold potatoes and 1 bag of green grapes in half. In a large bowl I put the potatoes and grapes, add a tablespoon of kosher salt, 1/2 a teaspoon of black pepper, 1 tablespoon of dried oregano, and enough olive oil just to coat them, and mix them up gently. Then in a large roasting pan I put the potatoes and grapes, all the peppers, onions and garlic, and I just toss all those ingredients together. 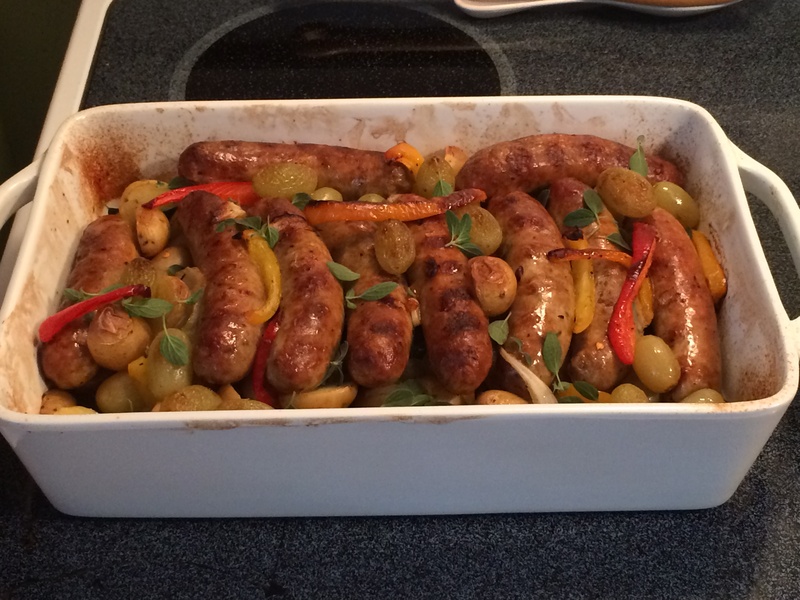 I lay the Italian sausages on top. I then take some chicken stock about 1/4 cup, pouring it one time around the pan so that it slowly seeps to the bottom, and a 1/2 cup of chardonnay doing it the same way. The oven needs to be at 400 degrees and this dish will take about 35-40 minutes. After this dish comes out of the oven, I garnish with some fresh oregano, and serve this with some good crusty bread. I promise you, you will love this dish.